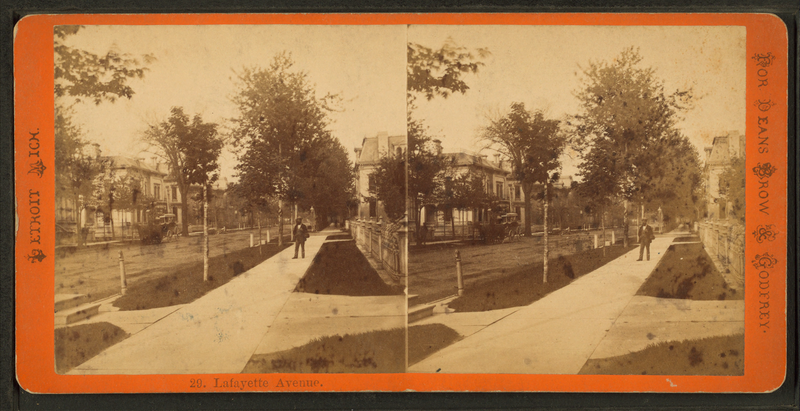 Lafayette Avenue, Detroit, circa 1880. Wikimedia Commons, Robert N. Dennis Collection of Stereoscopic Views. Note to readers: Those who follow my blog will know that this posting is a bit longer than usual and involves citations, which is something I have generally tried to avoid. Thank you for reading and I hope this format, which I will use occasionally, will be of interest to some of you. Several times in the past year I have turned to Legends of le Detroit to research a story. For those who are interested in early Detroit, this book is a unique treasure rooted in French Canadian culture, which formed the basis of the city’s cultural fabric from its infancy. It is something that, were it not for one woman, may never have surfaced and all its lore, a record of oral traditions stretching into past centuries, might have been lost. Rather than a symptom of nostalgia, her work in recording this folklore suggests a living connection to French Canadian culture and a deep concern with maintaining it. This was a culture she understood as her own and that she identified not only with Detroit, but also Quebec, to which she had personal links, and ultimately France. At the age of 28, Hamlin delivered this paper before a heritage society which, to judge from the list of officers published in The Report, was largely bereft of French names. For the Society as a whole, it can be generalized that ‘pioneer’ meant the descendants of Anglo-Americans who relocated from the East early in the 19th century rather than the original French inhabitants of the area. Her address covers customs, documents the lives of notable figures in early Detroit, and attempts to give the reader a sense of the life of French Detroit. First, I will highlight her remarkable introductory statements. The intent of this passage is somewhat unclear, although in context it can be read as a defense of the French Canadian woman. Is this an assertion that when it came to beauty and style, she and her compatriots would not be seen as second to the English or American? It raises questions about how the British and Americans viewed French Canadian women in general. Hamlin included two documents for the address, transcribed and translated from the French: records of a marriage and a property deed. With regard to the property deed, which stipulated the transfer of property from one generation to the next, she indicated that a certain property in question still [in her day] remained in the Godfroy family, which was “five generations removed” from the original inhabitants. It is conceivable that this was a subtle provocation of her audience, a comment directed at “pioneers” who were one or two generations in Detroit, on land settled and farmed for a century prior to their arrival by French Canadians and in some areas much longer by Native Americans. The subtext of her address seems to be: here was a community that valued family, good behavior, and tradition all of which have since been debased by the “conquerors.” Scholarly studies of early Detroit have revealed the scorn with which the French Canadian was viewed by the British and Americans when they encountered each other. As Hamlin indicated, the British and Americans were not magnanimous in victory nor did they see any honor in French Canadian culture. In effect, they saw nothing worth saving. They were true to the aphorism, “history is written by the victors.” Hamlin’s work shows that a young woman, within the context of a large, French Canadian family in late 19th century Detroit, had a visceral understanding of the mentality that was slowly erasing the culture of her family and the city they had helped to found. These, her written legacy, were predicated on her French Canadian identity and her family’s links to Detroit’s earliest history. They frame a recognition that her family stories, which were drawn from the wider French Canadian culture, would likely disappear if responsibility for recording them was left to the new Anglo-American majority. Hamlin’s work has been described as “avocational” ie, a hobby. However, I believe her works suggest a deeper engagement with the material than that. [vii] In her work with French Canadian folklore, Hamlin became an activist for her culture and a figure in wider Detroit society, someone whose public works promoted integrity in understanding the many layers of Detroit’s history. Without her work nearly 150 years ago, this dimension of folklore and tradition might have disappeared from our collective culture forever. Thanks David. Funny how we came to the same topic around the same time. I always keep up with your blog – this was a great post. I wonder if Hamon and Hamlin knew each other. She had contacts around the country, so it is possible. It would be interesting to explore F/C nationalism in the US in that era more deeply. Thanks for writing this article. I’ve loved Legends of Le Detroit since I first borrowed it from the library and read it to my children. They not only loved the beautiful and eerie folk tales in this book, but Mrs. Hamlin’s lyrical writing style too. They asked to renew it many times. This book is a great way to teach kids about Detroit’s early French history. Thank you for the comment Vivian – it is nice to hear from people who know the work and who have made it a part of their family life. If you have not heard about it, you may be interested in this petition that I started: http://www.change.org/fr/p%C3%A9titions/the-governor-and-legislature-of-michigan-proclaim-an-annual-french-canadian-heritage-day-in-michigan I will be making the submission to the governor soon! I have a book printed in Detroit by Thorndike Nourse. 1884. It’s worn but condition is good. Thank you. I believe I’ve come across this book as well, or at least reference to it. Thanks for the information! Mike Nabozny Pro Mechanical Services, Inc. I was recently researching Hamlin, and found a passage in her book where she cites her great uncle, Robert French Navarre as one of her sources. He was the first “white child” born in Monroe (1791) and lived to be 90, and thus a witness to great societal change. In his obituary it’s noted that he was a frequent visitor at the local newspaper office, and told many stories of his youth and the War of 1812. No doubt he was a source of much FC oral history. His story of his father bringing the Jesuit Pear to Monroe is noted in his obit, and the same story is repeated in numerous publications of the time period by influential people who all had connections to Monroe.